↑ "Constitution of the Republic of Uzbekistan". ksu.uz. पहुँचतिथी 1 जनवरी 2015. ↑ Foltz, Richard (1996). "The Tajiks of Uzbekistan". Central Asian Survey. 15 (2): 213–216. doi:10.1080/02634939608400946. ↑ Cornell, Svante E. (2000). 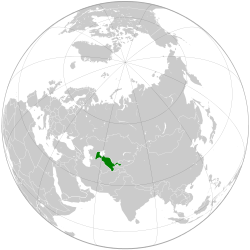 "Uzbekistan: A Regional Player in Eurasian Geopolitics?". European Security. 20 (2). ओरिजनल से 5 मई 2009 के पुरालेखित. ↑ "CIA – The World Factbook". Cia.gov. पहुँचतिथी 28 जनवरी 2011. ↑ "Official population 1 जनवरी 2015" (Russian में). Stat.uz. 16 मार्च 2015. ↑ Численность населения Узбекистана превысила 30 млн. человек (Russian में). Uzreport.com. 5 September 2013. पहुँचतिथी 6 September 2013.